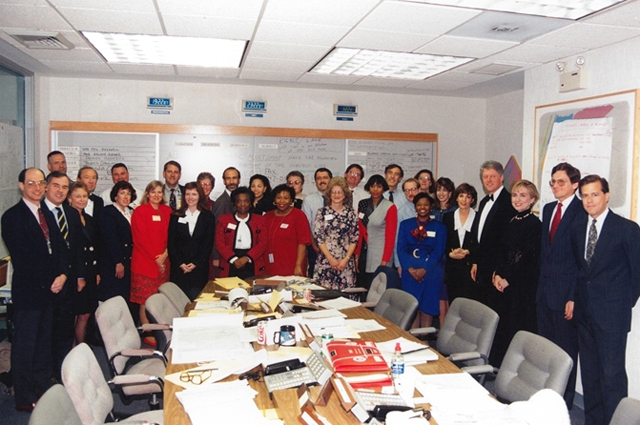 President Bill Clinton and First Lady Hillary Clinton meet with State Department Staff on April 11, 1994 in the room where the Rwanda Monitoring Group met 24 hours a day from April 7th through April 15th in Washington, DC, 1994. Photo from the personal collection of Prudence Bushnell. Part One: The Leadup to the Genocide. French, US, UN, and Belgian Documents Foreshadow the Genocide in Rwanda 1994. 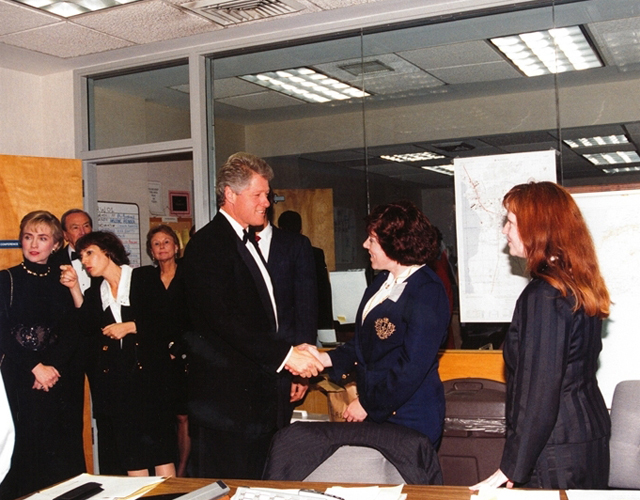 The U.S. and the Genocide in Rwanda 1994: The Assassination of the Presidents and the Beginning of the "Apocalypse"
Prudence Bushnell speaking with First Lady Hillary Clinton at the State Department in Washington, DC on April 11, 1994. Photo from the personal collection of Prudence Bushnell. Washington, DC, January 30, 2015 –	Former Ambassador Prudence Bushnell's notebooks provide a never-before-seen view into the inner workings of US diplomacy during one of the international community's darkest hours in recent decades. Her personal notebooks, published here for the first time by the National Security Archive, shed light on the Ambassador's own personal ethical struggles, not only with US foreign policy regarding non-intervention during the humanitarian crisis, but also the moral dilemmas that the international community faced from its unwillingness to intervene while genocide ravaged Rwanda. Today's posting is the product of a partnership between the National Security Archive and the United States Holocaust Memorial Museum to mark the 20	th anniversary of the genocide in Rwanda. Ambassador Bushnell donated high-resolution scanned copies of her personal notebooks to the National Security Archive. The additional documents posted today were obtained through Freedom of Information Act (FOIA) requests, the State Department Electronic Reading Room, and from the International Criminal Tribunal for Rwanda (ICTR) evidence. Front cover of Prudence Bushnell's Personal Notebook No. 3, 4/6/1994-5/15/1994, courtesy of Prudence Bushnell. Through Ambassador Bushnell's eyes we can see the international community's failure to effectively respond to the crisis in Rwanda, as well as her own personal moral dilemmas with US government policy. Her personal notebooks provide insights into the international community's decision making process and how previous events, such as the killing of US peacekeeping troops in Somalia in 1993 had an impact on world leaders and their reaction to the violence and genocide in Rwanda. In an interview from 2013, Ambassador Bushnell describes the failed US policy as merely "keeping busy with tasks that lacked impact so we could say that we were doing something," even though she knew the official policy of pushing for a cease fire was futile, stating "If you don't want to make a decision, then you keep everybody busy. You keep the pot boiling, but you don't have to make a decision. And that is what we were doing." After she was unable to accept an offer to serve as Ambassador to Rwanda in 1992 for family reasons, Bushnell served as Deputy Assistant Secretary (DAS) of State for African Affairs until she was appointed Ambassador to Kenya in 1996. 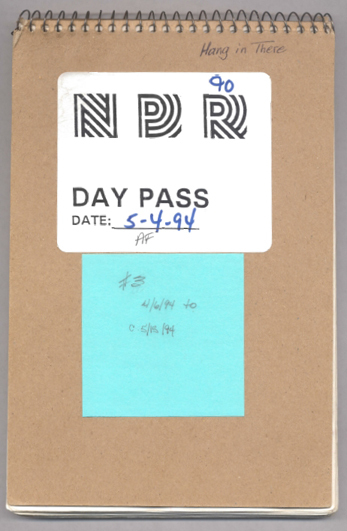 While serving as Deputy Assistant Secretary, Bushnell kept these personal notebooks detailing her day-to-day meetings and phone calls regarding US foreign policy at the time. Her notebooks, along with other Department of State documents, provide a rich and detailed account of the Africa Bureau within the Department, and the larger bureaucracy of US government. "…there had been no progress. The…UNAMIR mandate was [going to be] up in April. So this was March. The agreement was that transitional government would be put in place in early January, and there was just a lot of fussing and feuding, and an increase in violence. So the decision was that I was going to go to press all parties [Rwandan government and RPF], to stop, take a break from going down respective assassination lists, and move on getting the parliament going, and transitional government in place." 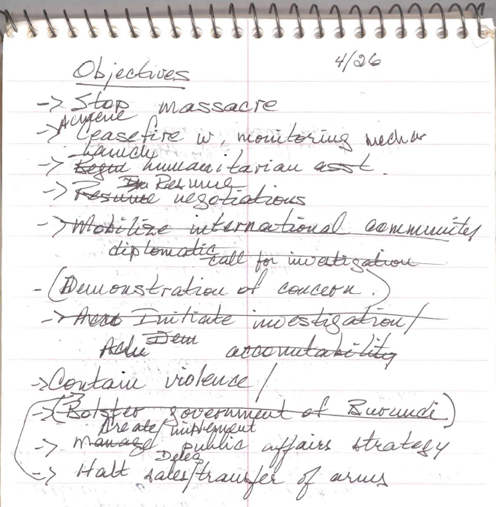 Bushnell took notes in these notebooks in preparation for her visit to Rwanda and Burundi within the larger context of regional policies, including issues of US foreign aid, democracy, human rights, and the HIV/AIDS crisis. In addition, to urge the Government and RPF to move on the installation of the transitional government, Bushnell also planned to meet with UN Special Representative Jacques-Roger Booh-Booh, and UNAMIR Force Commander, General Roméo Dallaire to discuss peacekeeping operations. A declassified cable notes that she also hoped to "visit a refugee camp and meet with appropriate contacts (particularly NGO's and community leaders) to discuss human rights and AIDS issues," as time permitted [Document 3]. 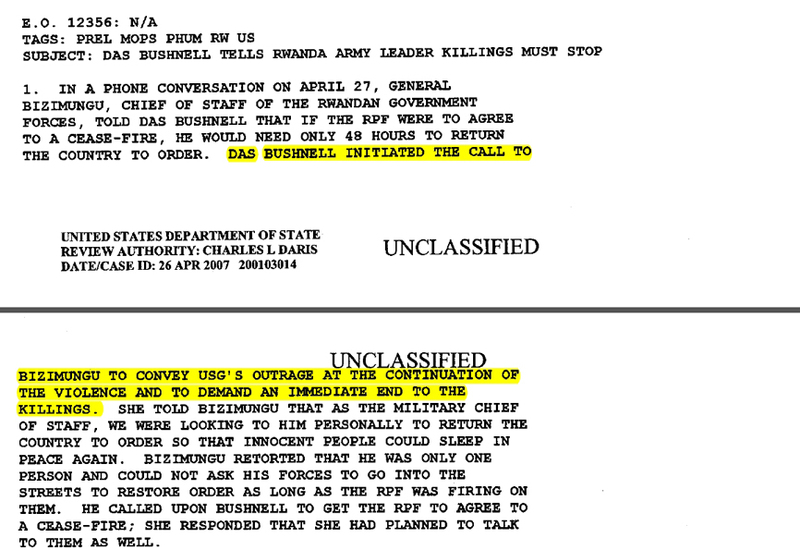 Declassified documents reporting on Bushnell's trip describe the clear message she and colleague Arlene Render, Director of the Office of Central African Affairs, delivered at the meetings with the Rwandan Government and the RPF stating that "The US needs indication that the peace process is moving forward in order to maintain US support for a peacekeeping operation," and for Rwandan leaders to "take responsibility for the future by acting to resolve the impasse" [Document 5]. Additionally, the cables report that Bushnell reminded President Habyarimana that a peacekeeping mission in Rwanda was hard to sell to the United States in the first place, and that the political impasse would make it more difficult for them to maintain support. Finally, the documents also report that the CDR [Coalition for the Defense of the Republic], a Hutu extremist political party, was the "major stumbling block to setting up institutions" [Document 6]. Just a week after Bushnell returned from her visit to Rwanda and Burundi at the end of March, Rwandan President Habyarimana's plane was shot down in the late hours of April 6, 1994. In one of the first official reports to then Secretary of State Warren Christopher about Habyarimana's death, Bushnell wrote of "a strong likelihood that widespread violence could break out"  [Document 7]. The US government responded to the events on April 6th by assessing the situation facing US embassy personnel and citizens on the ground in Rwanda, and devising government policy regarding the escalating crisis. 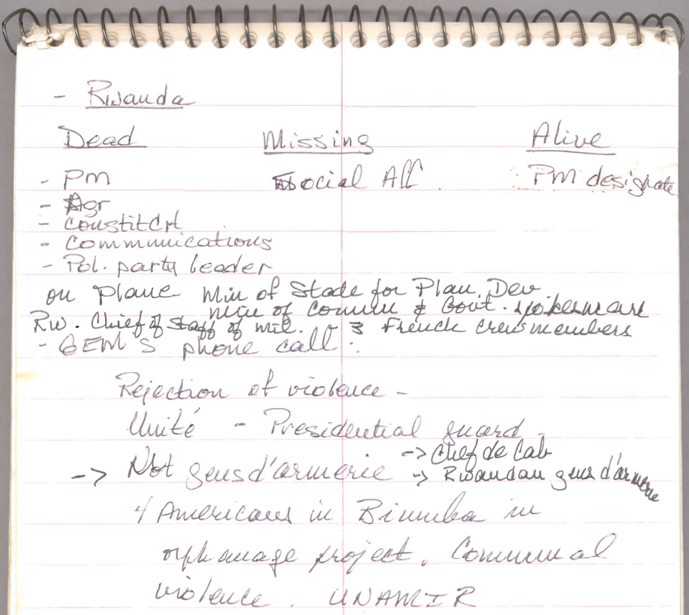 In her notebook pages from April 6th, Bushnell attempted to follow the genocide as it unfolded, jotting down a list of the key Rwandan politicians that were known to be "dead," "missing," and "alive", including Prime Minister Agathe Uwilingiyimana who was assassinated on the first day of the genocide [Bushnell Notebook 3, page 3]. The next day, the Department of State set up the Rwanda Working Group to provide non-stop analysis and response to developments in Rwanda and maintain a constant telephone connection to embassy personnel on the ground [Document 10]. By April 8th, the decision was made to withdraw all American personnel and citizens from Rwanda. The evacuation took place by convoy, leaving Kigali and traveling south to Burundi [Document 8]. Only one American, a Seventh Day Adventist missionary, Carl Wilkens, remained to provide humanitarian aid to orphanages. Wilkens explained in a 2013 interview that "...the needs that were there were so strong in our face that we just worked to respond to those needs as best we could." Along with the Americans, nearly all foreign governments evacuated their personnel and citizens, leaving behind a handful of journalists, humanitarian aid workers, and the UNAMIR peacekeeping troops. Documents in this posting comment on the availability of Belgian and French troops for the evacuation of foreigners. In a discussion of these efforts at the UN Security Council in New York, the Belgians reported that they had "500 Belgian paratroopers standing by in Nairobi to reinforce the 400 Belgians in Kigali if needed. They will stay...'Until the last Indian shopkeeper is out.'" The same document noted the success of French troops in controlling the airport and locating their nationals, but also noted that "...the French forces would leave Rwanda as soon as all French were evacuated" [Document 12]. Within days of after the commencement of the genocide, discussions about the possibility of withdrawing UNAMIR peacekeeping troops began at high levels of the US government, the UN, and the international community. US Ambassador to the UN, Madeleine Albright, wrote to the Secretary of State on April 11	th, reported that although a discussion of two possible options regarding UNAMIR did take place, "the Secretariat did not indicate whether they would ask to beef up UNAMIR's size and mandate, or pull out"  [Document 12]. Around April 11th, Bushnell wrote in her personal notebook that "NSC [National Security Council] requested IO [Office of International Organizations] to draft resolution to pull UNAMIR"  [Bushnell Notebook No. 3, page 52]. At that time, Richard Clarke and Susan Rice, the key officials in the NSC working on the US response to the Rwanda crisis, had directed Albright to support a withdrawal of UNAMIR at the UN. An April 13, 1994 memorandum from Douglas Bennett to Secretary of State Warren Christopher (via Peter Tarnoff) regarding an upcoming telephone call to Secretary General Butros-Ghali, indicates that the US supports terminating the UNAMIR peacekeeping operation, and that "…this is not just a Belgian idea." The document states, "Given the chaotic conditions in Rwanda, it is impossible for UNAMIR to fulfill its mandate. It is our view, therefore, that the force should withdraw from the country now. At an appropriate time, the force's mandate should be terminated"  [Document 15]. While we can start to piece together an idea of where the decision to pull out originated, thanks to recently released correspondence between UN representatives from the UK, New Zealand, and Czech Republic and their home governments, we are still missing key documents about how the decision was made within the US government. Crucial documents that would help us understand this decision to call for the withdrawal of UNAMIR troops are in the collections of the Clinton Presidential Library but have been held up by bureaucratic red tape for over a year, and remain unavailable to the public. After the withdrawal of US embassy officials and nearly all American citizens, the US shifted efforts toward developing both short- and long-term strategies to address the crisis in Rwanda. As one of the leading State Department officials handling the crisis, Bushnell made telephone calls to Rwandan and RPF officials calling for a ceasefire. However, not only did that strategy and policy fail, declassified documents show that other US government officials mocked her for her efforts. 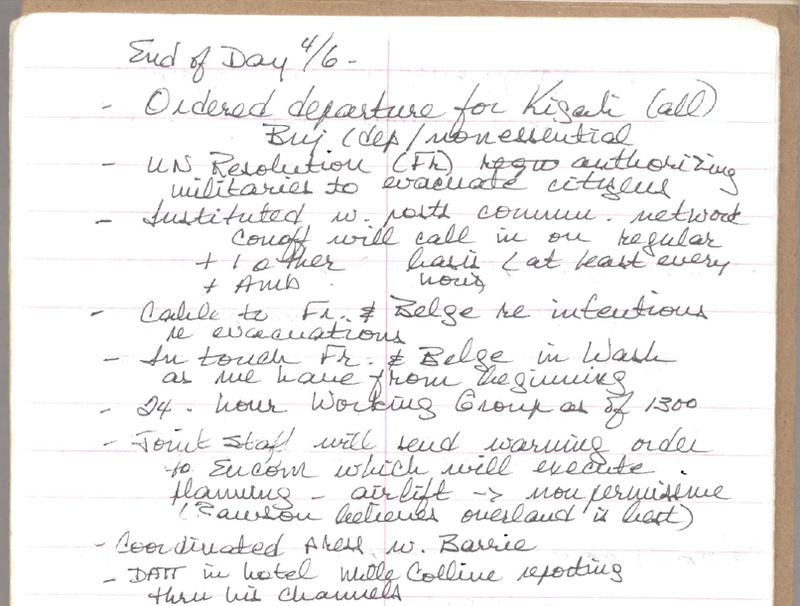 Bushnell's personal notebooks detail the formation of US policy, the strategy for implementing the policy, notes of her telephone calls with the Rwandan officials, and her frustrations attempting to implement US policy. The State Department directed the effort and coordinated "inter-agency strategy meetings" during which officials from a variety of agencies drafted US foreign policy action plans. The US strategy was to stop the "politically and ethnically motivated massacres," and push for a ceasefire between the RPF and the Rwandan Government Forces (RGF), followed by a return to the implementation of the Arusha Accords  [Documents 18 and 19]. 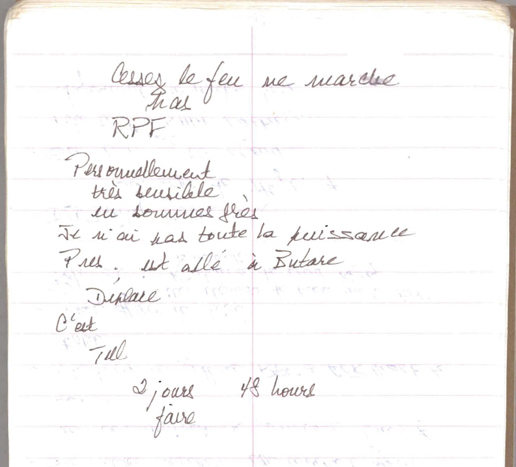 One of the strategies used to try to reach US objectives was to have Bushnell push the RPF and the RGF to "achieve ceasefire by diplomatic means" [Document 18]. Bushnell took extensive and detailed notes on these policy strategy meetings [Bushnell Notebook 3, pages 66-67, 69]. 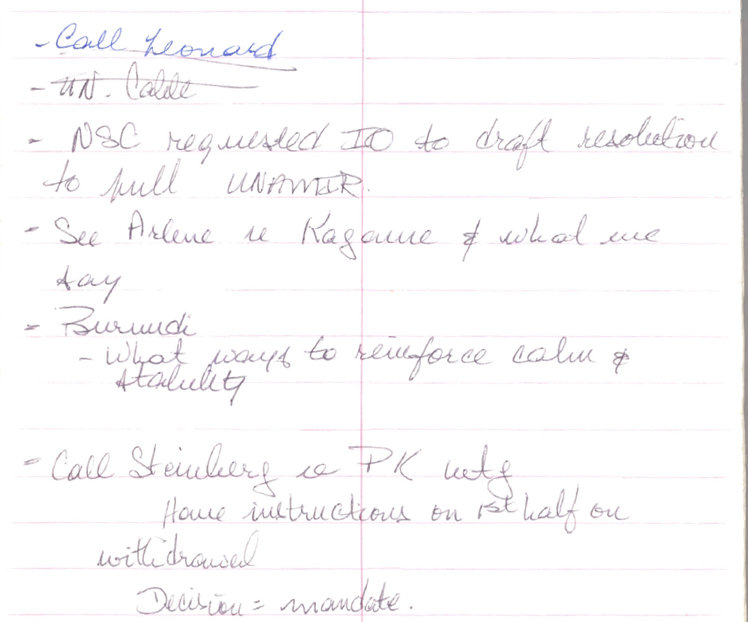 Bushnell recorded notes from these key telephone conversations in her personal notebooks. In telephone calls with Bagosora and Bizimungu in the last days of April, she pushed them towards a ceasefire, conveyed the USG's outrage at the continuation of the violence, and demanded an immediate end to the killings. As detailed in her notes, the government officials responded that a "ceasefire does not work" and that they did not have the power to stop the killings [Bushnell Notebook 3, page 74]. Another cable reports on one of Bushnell's conversations with Bagosora reports, "Consistent with the line taken by others in the GOR and Rwandan Army, Bagosora said the RPF's offensive is triggering the massacres and that a cease-fire was needed before the killings would stop. He characterized the killings as a spontaneous reaction by the population to the RPF offensive" [Document 26]. "Madame, you don't understand, there is a civil war going on here, and we do not have the forces to stop the spontaneous uprising of the people, was how we called it. Well, at least stop the hate radio. Ah, mais Madame, we are a democracy. We believe in freedom of the press. That is how ridiculous or bizarre our conversation was." After this conversation, Bushnell noted a "request to DOD to deploy [radio] jamming aircraft"  [Bushnell Notebook 3, page 84]. Bushnell also spoke on the telephone with RPF General Paul Kagame during which she recited to him the standard US government talking points at the time: return to a ceasefire, and stop the killing. He explained to her that "families staying in Hotel Mille Collines are trapped by [the] army" with nowhere to go. Kagame went on to express that the main focus is "saving people's lives first," and he worried that the "ceasefire will not stop [the] killing" [Bushnell Notebook, pages 86-88]. The strategy to call Kagame, Bizimungu, and Bagosora, was one of a few tools that Bushnell and other diplomats had available to them. However, there was contention within the government as to the efficacy and purpose of the strategy. Bushnell recalls the reaction of the Joint Chiefs of Staff to this strategy in her interview. In a report on a Rwanda interagency teleconference on May 11 1994 discussing reports of the Rwandan government's plans to attack the Hotel Milles Collines, Lt. Colonel Michael Harvin writes, "AF/C [Central African Affairs] solution? Pru Bushnell will call the GoR military and tell them we will hold them personally responsible if anything happens (!)" [Document 37]. In her 2013 interview, Bushnell comments: "I knew these guys were making fun of me, but you know what? It worked. People got out of the Hotel Rwanda. " "So in that context, when you don't have a policy, then anybody's inclination has as much validity as anybody else's. So DOD had the inclination to, whatever happened, not involve any resources of the Department of Defense...The inclination of the Department of State was to broaden the very narrow parameters of movement we had, as much as possible, to save as many lives as possible." "...people were so frustrated...Here we have no resources. UNAMIR's out, Monique [Mujawamariya]'s out, the Americans are out. But - and we're not going to do anything except hold a teleconference every day at noon." Access to Bushnell's personal notebooks provides an invaluable window into the day-to-day life of a US diplomat and policy maker during one of the most challenging and grim moments of modern US diplomatic history. It shows the human toll of the failed policies, on both ends of the telephone. 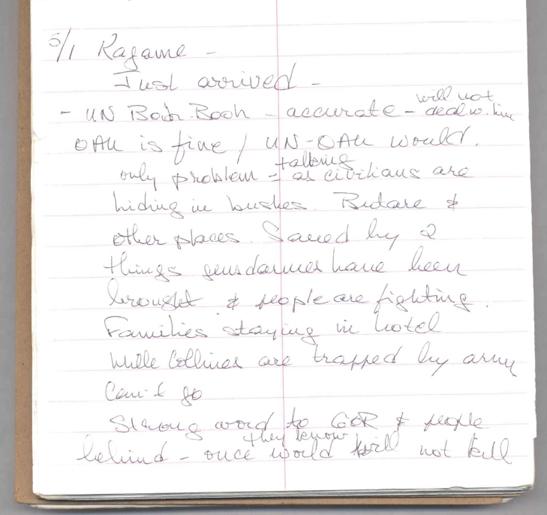 The personal notebook, paired with declassified documents and oral history interviews with Bushnell and others, help us to better understand the moral dilemmas faced by the international community, the US government, and Bushnell herself when considering responses to genocide in Rwanda in 1994. This unusual opening into the governmental decision-making processes provides important insights that can be used by policy makers and civil society advocates working to make changes in existing structures to prevent future genocide or other mass atrocities. It is therefore essential that there be continued and increased access to this key government information. While several governments such as the United Kingdom, New Zealand, and the Czech Republic have been forthcoming in releasing many of their key documents, the only publicly available French documentation was leaked to researchers in 2005, and extensive records collections at the United Nations still remain unavailable to the public. In the US, several agencies have been unacceptably slow to release the most critical sources about the highest levels of decision-making, in particular specific collections at the Clinton Presidential Library. Genta Hawkins Holmes, Director General of the US Foreign Service, writes to Prudence Bushnell (at that time Deputy Chief of Mission to the Republic of Senegal) to congratulate her on her new posting as Ambassador to Rwanda. The letter gives an overview of Bushnell's diplomatic and bureaucratic duties, emphasizes the importance of staffing the embassy with the right people, and the importance of using financial, material, and personnel resources wisely. The document also notes available seminars and resources for newly posted Ambassadors, but does not provide any information specific to Rwanda. *Note: Bushnell was unable to accept the offer to serve as ambassador to Rwanda for family reasons, and was subsequently offered a position to work for Assistant Secretary of State for African Affairs George E. Moose as the Deputy Assistant Secretary of State for African Affairs from 1993 to 1996. She also went on to serve as US Ambassador to Kenya from 1996 to 1999 during which the US Embassy was bombed by al-Qaeda. She also served as US Ambassador to Guatemala from 1999 to 2002. This document reports on a call between Deputy Assistant Secretary (DAS) for African Affairs (AF) Bushnell and French Embassy Africa-Watcher, Herve Dejean de la Batie, regarding the establishment of a Neutral Multinational Peacekeeping Force (NIF) to monitor the implementation of the Arusha Accord. The memo shows that the US supports the force, but is not committed and is concerned about limited resources. De la Batie outlines the French proposal for peacekeeping and addresses some American concerns about financing and scope. Bushnell brings up possible cooperation between peacekeeping forces in Rwanda and Liberia. France is not prepared to support Liberia, and wants to ensure Rwanda receives equal attention. In March of 1994, as those on the ground in Rwanda are trying desperately to install the Broad-Based Transitional Government (BBTG), Deputy Assistant Secretary for African Affairs, Bushnell is headed to Rwanda. This document details the preparations for her trip and lists the people she intends to meet and issues she hopes to address while she is there. Most notably these include Rwandan President Juvenal Habyarimana, the UN Special Representative to the Secretary General, Jacques-Roger Booh-Booh, and the UNAMIR Force Commander, General Roméo Dallaire, as well as a possible visit to a refugee camp in the area. This memo contradicts media assertions that the Burundi government has been overthrown. It reports on Bushnell's actions in Burundi, including her urging a halt to the violence and a return to peace. The memo adds that although the country is unstable, government and businesses remain open. Some of the violence in Bujumbura is attributed to a group of armed Hutu assailants; however state security forces are also accused of excesses. The Burundian military reports confrontations with both Hutu and Tutsi extremists. The document provides no credible estimates of the number of deaths resulting from the violence, but it mentions that it could range in the hundreds of thousands. *Note: In a 2013 interview, Bushnell explained that her actions were part of a US Embassy strategy to stop the killings in Burundi on the theory that the army and government would be less likely to kill if they knew foreigners were paying attention. In the case of Burundi, she asserts this strategy worked. During their visit to Rwanda, Bushnell and Arlene Render, Director of the Office of Central African Affairs, deliver a clear message to Rwandan officials, stating that "The US needs indication that the peace process is moving forward in order to maintain US support for a peacekeeping operation." They also called for Rwandan leaders to "take responsibility for the future by acting to resolve the impasse." The document outlines the content of different meetings held with the Prime Minister, Agathe Uwilingiyimana, and Foreign Minister Anastase Gasana. *Note: Bushnell did not take her notebook with her on the trip to Rwanda and Burundi. When Bushnell meets with Rwandan President Habyarimana and the RPF leadership on her trip to Rwanda, she urges the speedy installation of the transition government. While Habyarimana assures Bushnell that he is committed to the implementation of the Arusha Accords, the RPF leadership blames the president for the current political impasse. Bushnell reminds President Habyarimana that a peacekeeping mission in Rwanda was a hard sell to the United States in the first place, and that the political impasse would make it more difficult for them to maintain support. Finally, the document notes that the CDR (Coalition for the Defense of the Republic), a Hutu extremist political party, is the "major stumbling block to setting up institutions." In a memo to the Secretary of State, Bushnell reports that the private plane of Rwandan President Habyarimana has been shot down, and that both Habyarimana and Burundian President Cyprien Ntaryamira were killed in the crash. Bushnell notes that while UNAMIR leaders are encouraging the military to work within the framework of the Arusha Accords to decide on who should lead the country, the military is reluctant to do so. Finally, she notes that, "...there is a strong likelihood that widespread violence could break out in either or both countries…" and that the US strategy is to appeal for calm. This document is an activity log that gives a minute-by-minute account of the Department of State's "Rwanda Working Group" which was tasked with monitoring the situation in Rwanda. Bushnell was the senior official in charge of the working group which convened on April 7 1994 at 13:39 and disbanded on April 15 1994 at 19:00. In this document the French Government agrees to take over the Kigali airport in order to permit the evacuation of foreign nationals, in coordination with Belgian forces. The French do not intend to notify the Rwandan Army or the RPF until after the airport is seized. Secretary of State Warren Christopher directs that a 24 hour working group should be established in order to deal with the situations in Rwanda and Burundi. The working group is under the direction of Bushnell and includes representatives from other offices within the State Department including AF (Africa Bureau), INR (Bureau of Intelligence and Research) and IO (International Organizations) along with six others. In the first situation report from the Rwanda Working Group, it is reported that there is relative quiet in Kigali as the military announces the formation of a crisis committee, and calls for a meeting with the Rwandan government. Additionally, there are unconfirmed reports of the assassinations of Rwandan government personnel, along with the killing of eleven UNAMIR soldiers. The UN Security Council approved a statement strongly condemning the violence and countries like France, Belgium and the US are considering options to evacuate their citizens currently living in Rwanda. This document summarizes a briefing to the UN Security Council by UN Department for Peacekeeping Operations (DPKO) Deputy Iqbal Riza on attempts to call for a ceasefire in Rwanda, and the barriers to such an agreement. It describes in detail the progress of the evacuation of foreign nationals, and the plans for withdrawal of French troops sent there to oversee the operation. In regard to UNAMIR troops, the memo notes that there are two possible scenarios for the future. If a cease-fire and political agreement are reached, UNAMIR could resume its mandate. If the situation deteriorates the Security Council will need to reevaluate the mandate. US Ambassador to the UN Madeleine Albright notes that "The Secretariat did not indicate whether they would ask to beef up UNAMIR's size and mandate, or pull out". The memo also notes that UNAMIR is guarding areas where refugees have gathered, and reports on the number of Rwandan civilians within the safe areas. Bushnell later cited this cable in a 2013 interview, asserting that this was when the US first put it "on the table" that the troops in Rwanda sent to evacuate foreigners could also evacuate UNAMIR. This State Department situation report focuses on the evacuation of foreign nationals from Rwanda, reporting that the RPF agreed to a 48-hour truce allowing for the operation to take place. It also includes a report from the Red Cross (ICRC), stating that the organization has been able to provide some humanitarian relief to Rwandan citizens. It notes that the UN DPKO informed the US mission to the UN that Monique Mujawamariya had been evacuated, which President Clinton and Bushnell, had been concerned about. Douglas Bennett briefs Secretary of State Warren Christopher (via Peter Tarnoff) on an upcoming phone call to Secretary General Boutros-Ghali regarding both Bosnia and Rwanda. Bennett suggests that the Secretary make it clear to Boutros-Ghalia that the US supports terminating the UNAMIR peacekeeping operation, and that "…this is not just a Belgian idea." The document states, "Given the chaotic conditions in Rwanda, it is impossible for UNAMIR to fulfill its mandate. It is our view, therefore, that the force should withdraw from the country now. At an appropriate time, the force's mandate should be terminated." In a 2013 interview, Bushnell asserts that this decision came from the NSC. In this memo, Render briefs Bushnell on the US position on the future of UNAMIR. She writes that the only "politically and ethically viable option" is that of "Alternative II" given by the UN Secretary General, Boutros Boutros-Ghali. This option would entail maintaining a UN political and military presence in Rwanda in order to push for ceasefire and to watch over those civilians currently under UN protection, "...assuming that UNAMIR's own security can continue to be met." The State Department is outraged by threats made to Mujawamariya and her family by Rwandan nationals (possibly Rwandan embassy employees), after she left a meeting in Washington, DC. Rwandan Ambassador Uwimana may have made further threats to Mujawamariya's children (although he denies this). Bushnell spoke to Uwimana to express the Department's outrage, stating that "…this type of behavior gives [the US] a very bad impression of Rwanda." Bushnell also requested that the Ambassador look into who had made the threat, which he agreed to do. Almost three weeks into the genocide, Assistant Secretary of State for African Affairs George Moose outlines the US strategy in Rwanda thus far. The strategy has been aimed at stopping the massacres, achieving a durable ceasefire, getting both parties back to the negotiating table, containing the conflict and re-launching humanitarian relief efforts in the country. The document goes on to explain all of the actions that have been carried out to try to reach the above listed policy goals. This document outlines the US State Department's short term policy objectives-six priorities listed with actionable details. The first priority is to stop the ongoing massacres, followed by achieving a ceasefire and resuming negotiations within the Arusha Accords framework. In order to achieve these objectives, demarches are to be made to both the Rwandan Government and the RPF, as well as coordinating with the UN, issuing high-level statements, instituting economic sanctions, and keeping UNAMIR in Rwanda. In this document, Bushnell discusses the coordinated strategy to respond to the crisis in Rwanda. Most notably, at the end of the document she writes that while it is the intention to build on efforts already made to achieve US policy goals, "At the same time, we must recognize that our ability to influence events in Rwanda is limited and, in the end, only the Rwandans themselves can bring peace to their country." On April 26th, Bushnell hosted a meeting on "Next Steps in Rwanda" in which she presented short-term US Government policy options and assigned Action Offices within the State Department. Again, the top two priorities on the list are to stop the ongoing massacres and achieve a ceasefire via diplomatic means. This agenda outlines US Government short-term objectives and strategies to achieve them in Rwanda. Policy objectives include stopping the on-going massacres, achieving a ceasefire (including keeping UNAMIR in Rwanda), resuming Arusha Accords negotiations, attempting to preventing the violence from spreading outside Rwanda, launching humanitarian assistance, and creating an overall US strategy for Rwanda. This document is a review of the short-term objectives and strategies described in other April 26th documents. It assigns action offices to each of the strategies. On April 27th, Bushnell had a phone conversation with General Bizimungu, the Chief of Staff of the Rwandan Government Forces. Bushnell called him to convey the "...USG's outrage at the continuation of violence and to demand an immediate end to the killings." His response is that if the RPF were to agree to a cease-fire he could restore order to the country in only forty-eight hours. Additionally, he reports that he couldn't ask his forces to go into the streets to restore order, "...as long as the RPF was firing on them." In a 2013 interview, Bushnell explained the purpose of the phone calls was an attempt to shine a "spotlight" on the perpetrators in an effort to replicate strategies that had worked in Burundi. She calls the strategy as "naming and shaming." In this daily update on Rwanda, Bushnell reports that the killing of civilians is continuing. She also reports that she spoke to the Rwandan Ministry of Defense Cabinet Director, Colonel Bagosora, to urge him to end the killings. According to Bushnell, he "responded with the party line." It is only after she confronts Bagosora regarding eyewitness accounts of Rwandan army complicity in the killings that he "sobers up" and promises to pass the message onto the military leadership. In this memo, Bushnell updates Tarnoff on the current situation and forecasts the need to devise a plan for when the "current crisis passes." Bushnell explains that the interim government is claiming that the massacres are being triggered by the RPF offensive, while this assertion does not correspond with accounts from the ground that the Rwandan army is complicit in the "killings of Tutsis and Hutu moderates." Additionally, she reports on the hundreds of thousands of refugees trying to leave Rwanda and the need to keep the UN peacekeeping force in place. Bushnell called Rwandan officials regularly to urge an end to the killing-to little effect. In this cable, Bushnell challenges Col. Theoneste Bagosora, as to who is responsible for the massacres. Bagosora responded that the killings were triggered by the RPF offensive, and said that a cease-fire must be achieved in order to stop the killing. The telegram also highlights the US government's preoccupation with returning to a "peace process," when much of Rwanda has descended into violence. The State Department sends John Shattuck (Assistant Secretary of State for Democracy, Human Rights and Labor) to Tanzania to speak with President Mwinyi and Prime Minister Malacela in order to ensure that they stay involved in the process and express appreciation for Tanzania's initiatives to return the two sides to the Arusha process. *Note: The Tanzanians served as mediators in the Arusha Accords negations which were held in Arusha Tanzania in 1992 and 1993, prior to the genocide. As part of US diplomatic strategy, Bushnell calls the Chief of State of the Rwandan Government, Bizimungu, to try to put a stop to the killing. They discuss ending the killings, the ceasefire and stopping the negative radio broadcasts, as Bizimungu continues to assert that he can bring a stop to the killings as soon as the RPF agrees to a ceasefire. At the end of the document, Bushnell comments that Bizimungu, "...seemed neither panicked by the fighting in the city nor in doubt that the GOR was anything but a victim of evil behavior." She adds that he seems "genuinely puzzled" that the international community would believe anything but the position of the Government of Rwanda. This memo discusses possible strategies to alleviate conflict in Rwanda, including an evaluation of a new UN resolution to be approved later in the week, emergency humanitarian aid and refugee assistance, and examining the use of Commando Solo aircraft to counter Rwandan radio broadcasts calling for additional deaths. This memo provides updates on Security Council discussions about Rwanda, including the possibility of sending in Organization of African Unity (OAU) peacekeeping troops. It also describes the steps the UN and OAU will take to decide how to support refugees and how it will be funded. The memo calls on states to provide material, logistical and financial assistance. This memo outlines the plans for French Ambassador to Rwanda, Jean-Michel Marlaud's visits to Tanzania and other countries in the region. Marlaud expects to meet with the Rwandan Government and the RPF, as well as President Mwinyi of Tanzania. The memo also discusses France's plans for humanitarian aid to refugees. Like many of the other documents, this memo focuses on refugee aid rather than ending the killings. On May 1, Bushnell receives a phone call from RPF General Paul Kagame to discuss how to end the massacres and reach a ceasefire. Kagame asserts that one practical way to end civilian killing immediately is to send a team of international observers from UNHCR (UN High Commissioner for Refugees) or to send the word to those in leadership positions in Rwanda that the international community will not allow the killing of innocent civilians to continue with impunity." Overall, Kagame stresses that even if a ceasefire is obtained, it will not necessarily stop the killings behind Government lines, therefore; the killings must stop before the RPF will agree to a ceasefire. In a 2013 interview, Bushnell describes how Kagame pleaded with Bushnell in a phone call imploring, "Madame, they are killing my people." He further stated that a ceasefire would make it easier for the genocide to continue. Bushnell expresses her personal difficulty as a government representative with limited ability to communicate her sympathy to Kagame while maintaining her role as a diplomat implementing foreign policy. On May 4th, Bushnell testified before the House Subcommittee on Africa about the crisis in Rwanda, underlining that after President Habyarimana's plane was shot down, killing of Hutu opposition politicians and Tutsis occurred, then fighting broke out between the Rwandan government forces and the RPF. She reports that the violence has left at least 100,000 dead at this point, a month into the genocide. The document goes on to describe the US actions taken thus far, future policy options, and an assessment of the UN Mission in Rwanda. In a meeting with Belgian and French diplomats, US State Department officials discuss the situation in Rwanda and Burundi, and review the US initiatives thus far. While the Belgians indicate a willingness to help in Rwanda, they push the US to take the lead, and the French continue to insist that any UN action taken in Rwanda should be purely humanitarian and should involve all regional actors. Alison Des Forges of Human Rights Watch and Monique Mujawamariya, a Rwandan human rights activist who had just escaped the genocide herself, meet with Bushnell to argue for policy initiatives such as jamming radio broadcasts, supporting an expanded UN force, and isolating the members of the Rwandan interim government. As Bushnell attempts to stick to her talking points on US policy. She tells Des Forges and Mujawamariya that she indicates that she "...was frustrated at not being able to do something concrete to stop the continuing massacres." A Interagency Working Group (IWG) meeting discusses in a report the likelihood of a potential attack on a hotel [the Hotel Milles Collines] where foreign press have taken refute. The discussion results in Bushnell calling the Rwandan military in indicate that if an attack is perpetrated, they will be held personally responsible. The document also reports that the US is to "ferry in" troops to Kigali and will airlift an additional "240 MT of food, medical supplies and tentage from Nairobi to Bujumbura", but the group indicates concerns of how the operations will be financed. The document reports on the discussion regarding the nature of the UNAMIR mission and whether it should be authorized under Chapter VI or Chapter VII of the UN mandate, which would affect UNAMIR's options in the field. Lt. Col. Michael Harvin describes the proceedings of a Rwanda Interagency Teleconference. The conference looked at updates to the on-the-ground situation in Rwanda and discussed possible US actions. Harvin notes that Bushnell will call the Rwandan Government and tell them they will be held "personally responsible if anything happens (!)." The Interagency group discusses other possible responses to the killings, the steps that would be necessary to implement them, and how feasible they are. It describes objections by the Joint Staff to any open ended mission or aid, as well as how effectively the Joint Staff explains why the US should not intervene in Rwanda. The memo also focuses on the possibility of setting up border refugee camps, and possible problems with those. In a 2013 interview, Bushnell explains her frustration with the pushback from the Department of Defense and other US government agencies regarding the efficacy of the strategy to telephone the Rwandan government demanding a stop to the killings and a ceasefire. In another Interagency Working Group meeting, the Joint Staff report to the group that National Security Council staff member, Richard Clarke has tasked to propose to the UN Security Council that the strategy to stabilize Rwanda should be to move "inward from the neighboring border areas 'securing' the territory along corridors as it advances." The group again addresses the issue of whether or not UNAMIR should be given a Chapter VI or a Chapter VII mandate and what position the US will take to the UN Security Council. As Prudence Bushnell tries to reach Colonel Bagosora once again to confront him about civilians being killed in Rwanda, she is told that he is on leave, and instead speaks with Rwandan Government Chief of Staff Bizimungu. Bushnell asserts that the US Government is going to hold Bizimungu, Bagosora and the President of Rwanda personally accountable for anything that may happen to those staying in the Hotel Mille Collines and any other civilians who have sought safety from the massacres. Bizimungu responds, "With that threat why don't you just take me out and shoot me," and goes on to explain that he isn't in charge of anything and that he shouldn not be lumped into the same category as Colonel Bagosora. Rwandan Ambassador to the US Uwimana calls on Bushnell and John Shattuck for a clear statement as to what US policy is on Rwanda. Shattuck emphasizes that "...the eyes of the world are on Rwanda," and that the "...GOR needed to issue orders for the killing to stop." Bushnell and Shattuck stress to Ambassador Uwimana they have made the same demarche to the RPF and that an immediate ceasefire is needed. In a meeting with State Department counterparts, RPF officials Patrick Mazimhaka and Gerald Gahima make it clear that they will not even think about a cease-fire until the killings stop, estimating that as many as one million Tutsis may have already been killed. Bushnell, Prudence. Oral History Interview, November 22, 2013, Washington, D.C., The National Security Archive. Bushnell, Prudence. "Personal Notebook No. 2, 11/1993-4/1994," Washington, D.C., The National Security Archive, pages 89-100. Bushnell, Prudence. Personal Notebook, No. 3, 4/6/1994 - 5/15/1994. Washington, D.C., The National Security Archive, page 3. State Department Document, "MGRW01 - Rwanda Monitoring Group," April 7, 1994. Wilkens, Carl. Oral History Interview, June 7, 2013, Washington, D.C., The National Security Archive. State Department Cable, USUN Mission to Secretary of State, "WGRWOL: Update from UN 4/11," April 11, 1994. Bushnell, Prudence. Personal Notebook, No. 3, 4/6/1994 - 5/15/1994. Washington, D.C., The National Security Archive, page 52. Bushnell, Prudence. Personal Notebook, No. 3, 4/6/1994 - 5/15/1994. Washington, D.C., The National Security Archive, pages 66-67, 69. State Department Cable, Secretary of State to US Embassy Bujumbura, "DAS Bushnell tells Bagosora to Stop the Killings," April 29, 1994. Department of Defense document, from Lt. Colonel Michael Harvin, "Rwanda Interagency Telcon," May 11, 1994. The story of the Hotel Milles Collines is depicted in the movie "Hotel Rwanda" (2004).